Whether you want to take a hike on one of 30 spectacular trails or see a Broadway musical in the Poway Center for the Performing Arts, Poway has something to offer for everyone! With a population of approximately 50,542 residents, Poway is known as “The City in the Country” and prides itself on the fact that over half of the City’s 39.4 square mile area is preserved as dedicated open space. The community also offers a diverse range of housing options, an outstanding school district, a thriving business park with over 19,000 jobs, a broad range of dining and shopping opportunities, beautiful parks, over 82 miles of trails, and 50 community events each year. 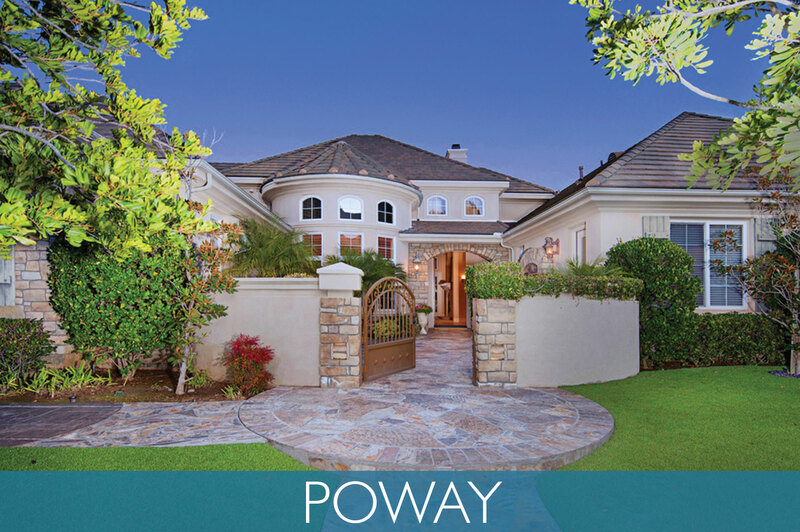 Poway is truly a great place to live, work, and play! View more about Poway on Pinterest! Conveniently located in the center of San Diego County, Poway offers a sunny climate, clean air, a pristine lake, and ecological reserves. Poway has carefully planned for balancing growth with the good life, offering an ideal place in which to prosper. Throughout the year, Poway also provides numerous family-oriented events including Old Fashioned 4th of July, Train Song Festival, Christmas in the Park, Youth and Adult Fishing Derbies at Lake Poway, Poway Days Parade, and summer concerts in the parks. Old Poway Park offers weekend train rides, a farmer’s market, old-fashioned shops, and a museum. There are also many golf courses including "Stone Ridge Country Club" and wineries to enjoy in Poway as well. Poway is ranked “6th Best City in California to Locate a Business” according to Outlook Magazine. Poway maintains its business excellence with a state-of-the-art Poway Business Park, a 700-acre complex, which encompasses the City's main commercial area. As part of the South Poway Planned Community, the Business Park offers tenants high-quality infrastructure, numerous amenities, and plenty of open space in keeping with the City's rural surroundings. The Poway Unified School District is heralded as one of the best in San Diego and recognized across the country as well. The district also includes such areas as Rancho Bernardo and Rancho Penasquitos.